Does this Bennie Ration necklace come with a Notarized COA? Will this come with a Certificate of Authenticity, preferably notarized? And, is it suitable for a man to wear? No it does not come with any paperwork – it has the artist’s hallmark on the back. 99% of Navajo, Hopi or Zuni jewelry comes with no paperwork, just the hallmarks. It is suitable for a man or woman. However, the item is sold. Thank you for your interest and let me know if I can answer any other questions. The authenticity of each jewelry item and artifact that we sell on Horsekeeping.com is confirmed in person by us or by our partners to be Native American made. We deal mainly with Native American Indian artists located in New Mexico and Arizona (the heart of Navajo, Hopi, Santo Domingo, Apache and Zuni country) and South Dakota (Oglala Lakota). In many cases, we purchase directly from the artists themselves. Buying in person allows us not only to confirm authenticity, but also to hand select the finest pieces, the best stones, and to learn interesting details about the people who make the jewelry. 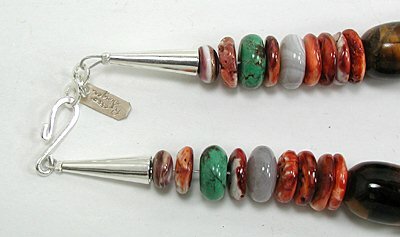 Jewelry that is Native American style but is made in China or the Philippines is NOT Native American made and legally cannot be called Native American. Yet it often is! These imported knockoffs hurt legitimate sellers and Native American craftspeople who are being forced out of the jewelry business because of the low prices charged for the fakes. If authenticity is important to you, buy only from reputable sellers who offer genuine Native American made merchandise. We at Horsekeeping.com describe our authentic Native American made items as “Native American”. When an item is NOT Native American made, we make sure you know that by calling it a Reproduction or putting it in our non-Native American section called the Bargain Barn. Every item we offer as Native American made is in full compliance with this act. Certificates of Authenticity. Legally, only the artist who makes a piece can fill out and sign a Certificate of Authenticity (COA). Therefore, for us to send you a generic certificate serves no purpose. Only about a half dozen of the artists that we purchase from provide COAs. Of the rest, many of them sign or put a hallmark on their pieces. Some do not. Buying from reputable sellers is your main assurance that the Native American item you purchase is Native American made. Are the heishi necklaces signed? A year ago i bought a T.Singer bracelet from you. 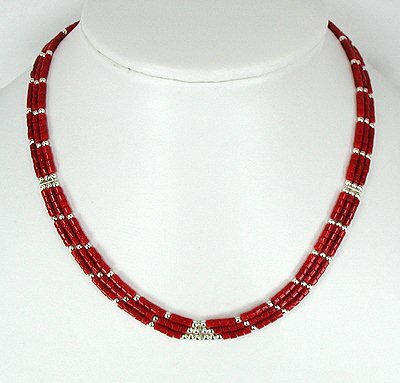 Now i am interested in purchasing 2 necklaces by Frank Ortiz—#NH 882 & #NH 883 but first 2 questions. #1. Are the necklaces signed, stamped by Frank ? #2. Do you include a Cert. of Authenticity for each ? Thanks for your attention to this email. As far as necklaces, the only way an artist could sign one is to include a disc or plate with their hallmark on it and string that on the end of the necklace. Some Navajo Pearl bead makers do that or stamp the last bead with their hallmark. But I know of no heishi maker that includes a hallmark. Tommy Singer and his son Richard do put name plates on their large gemstone necklaces, but that is about the only stone necklace signature I can think of. As far as Certificates of Authenticity……here from our website……….